Who can you trust to care for your animal family members when you're on vacation? Who can you turn to when you have to work late and your pets needs to go out or be fed? Who can help you with training and problem solving your puppy's behavior? We offer a FREE, no obligation meet-and-greet. We will come to your home to meet with you to discuss your pets needs, receive any special instruction for the care of your special loved ones, and ensure that you are comfortable with your sitter or trainer. Critter Visits was created by pet lovers to give you peace of mind when you are away from your pets. Our Critter Visitors ensure that your animals are safe, comfortable and happy by providing fresh food and water, love, cuddles, grooming, play time; daily exercise such as walks, playing Frisbee or ball, cleaning up accidents or other messes, on time administration of medications or supplements; safe delivery to vet, doggie daycare, grooming appointments, poop scooping for your yard. Critter Visits has been caring for pets of all kinds; dogs, cats, birds, rabbits, chickens, turtles, fish and more since 2002. We servicve Bellingham, Franklin, Holliston, Medfield, Medway, Milford, Millis, Norfolk and surrounding areas. We Board and Provide Playcare in a home. We take dogs at our house for an afternoon of exercise, for overnight stays, or for longer term vacations. While your pets are with us, they live with our pets and we treat them like family. They will play in our supervised, well fenced yard. They will sleep in our bedroom at the foot of our bed. We work hard to keep them safe and stress free in the kind of environment we would board our own dogs. 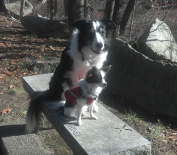 We can provide dog training, behavior assessment, temperament testing, and problem solving. We can offer solutions to your pet's issues, teach them basic obedience, and guide you to a better understanding of your dog. Our trainers will come to your home and use their years of practical experience and hundreds of hours of classroom training to work with your family toward real, balance based training solutions. We have pets of our own, and we know that keeping their routines is very important. We know what it's like to have young pets who need to go out more often when they're house-training, who have endless energy and who don't like to be alone for long. We also know what it's like when your pet gets older and needs help getting around, starts taking medications or may need to go out more often. We follow your instructions so that your pet's routine is not upset in any way, and that he or she gets the same loving care you provide when you are there. We offer many different visit times throughout each day to ensure that both you and your pet are comfortable and happy with whatever schedule you need. Critter Visits is in good standing with Pet Sitters International and the International Association of Canine Professionals. We are bonded and insured for your protection.